Today’s homily (sermon) at church was, in a nutshell, about spiritual grounding. 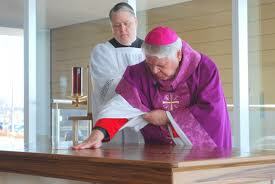 Monsignor recounted yesterday’s dedication of an area church where the Bishop performs deeply significant rituals. His story reminded me of one of the important aspects of cancer care both during and after your treatment – spirituality – so I grabbed my laptop and went right to work after church. The Rite of Dedication is long, complicated, and anything but a formality. In dedicating a church building, we proclaim with Jacob, ‘This is the house of God and the gate of Heaven’ (Gen. 28,17). One of the dedication rituals is pouring chrism, or scented and blessed oil (used for baptisms, confirmation and blessings), all over the new altar then rubbing it in. This physical act signifies the transformation from a simple piece of furniture to a religious centerpiece. Whether you are Catholic, protestant, Jewish or undecided, having a spiritual grounding or a “home base” to turn to during personal crisis is important. It is at the foundation of coping with personal crisis and a needed rest stop on my personal cancer journey. As Monsignor mentioned, when our world gets turned upside-down by the uncontrollable, it is comforting to know, and be able to reach out and count on something stable and solid. Like the altar that is dedicated for one purpose and sits firmly grounded, finding what that is for you during your cancer journey is critical for coming through with the best results. Whether you are a “believer,” or not, having a spiritual foundation provides a personal place to go anytime, anywhere. It is open 24/7 and is a welcoming space for you to give up your worries and help you navigate the world “out there.” The altar doesn’t move and awaits you. Make sure to visit it regularly and utilize it as part of your personal care. When friends and family tire of hearing about our cancer, worries of recurrence or aches and pains, the altar is there for you to deposit your tears, to absorb them and wipe them away as part of your transformative healing that takes place after cancer or ay major life crisis. Thanks Monsignor for your homily and for reminding me of the importance of being spiritually grounded.